Find all of the parts of the Gatekeeper and rebuild it. Travel to Xaselm and find Relmyna Verenim. Travel to Gardens of Flesh and Bone and collect the items. Return to Relmyna and build your gatekeeper. Sheogorath tasks you with rebuilding the Gatekeeper to quell the forthcoming invasion of Order. With the addition of Xedilian and a new Gatekeeper, New Sheoth's defenses will be impenetrable. You are to travel to Xaselm and speak with Relmyna Verenim about constructing a new Gatekeeper. If you speak with Haskill, he will mark Xaselm on your map, enabling you to fast-travel there. Upon arriving at Xaselm, you will be greeted by Relmyna's undead minions; chiefly, skinned hounds, flesh atronachs and failed experiments. Fight or avoid the undead denizens until you reach Relmyna's chambers in the Sanctum of Vivisection. Relmyna will initially be quite resentful towards you for killing her original Gatekeeper, but will eventually agree to construct another. She tasks you with the collection of four components, Osseous Marrow, Dermis Membrane, Essence of Breath and Blood Liqueur, from the Gardens of Flesh and Bone in the Fringe. She will also grant you a key so that you may access the back entrance to Xaselm in the future. Travel to the Gardens of Flesh and Bone and enter. It is easiest to collect each item in chronological order, as the map marker will highlight each respective item. Following the map markers will generally result in a linear dungeon crawl that will culminate at each respective item. The only noteworthy exceptions are the Essence of Breath and Blood Liqueur. Because of the multitude of criss-crossing tunnels, the Breath cannot be easily located using the map. A perpetual green mist, however, continually flows through the tunnels, indicating the path to the Essence of Breath. To reach the Blood, once you reach a closed door you will see a boss chest and three pushblocks. 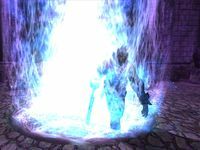 Activate the one facing the door to open it, as the other two cause hunger traps to activate and rocks to drop. Collect all the items and return to Relmyna. After bringing Relmyna the components, she will ask you to choose the parts for the Gatekeeper. Follow the map marker and choose a head, a torso, a heart, a right arm, a left arm, and a pair of legs from the selection. The choice of parts will be relevant at a later stage of the quest. Information about the various body parts can be found in the Miscellaneous Items article. Once you have chosen, speak again with Relmyna, who will instruct you to meet her at the Fringe. Proceed to the Gates and await her arrival. She will perform the Ritual, requesting at each stage that you place a component into the Cistern of Substantiation, before binding the components together to summon a new Gatekeeper. Be careful, if you are too close to the Cistern, you will be knocked down due to shockwaves, but it will not affect your health, and is just an inconvenience. Speaking to her again, she will thank you again and gift you with the greater power Summon Flesh Atronach. Shortly after, the Gatekeeper will come under attack by a group of Order Knights, led by the traitor Felas Sarandas; although it should have no trouble destroying them. To collect your reward, activate the Gatekeeper and you will receive one of the greater powers associated with the body parts chosen earlier (although you can only have access to one Gatekeeper greater power at a time). Return to New Sheoth and report back to Sheogorath. During your journey through Xaselm, you can encounter a number of traps, test chambers, and experiment logs. The experiments can be activated by pressing the various buttons around the chambers. When you encounter Relmyna, she is torturing prisoners in cages with spells. You can also kill them with magic, but it will not count as murder or incur a bounty. During the ritual, a powerful blast of energy will knock you off your feet. This effect is harmless, however. Unlike his predecessor, the new Gatekeeper is flagged as essential. The new Gatekeeper will not be hostile towards the player unless you strike him (although he may be hostile to Ushnar's Skinned Hound). You can't yield to him, so your options are to run for your life or try to defeat him. Choosing the Heart of Wound Sharing body part is one of the few ways to obtain the Reflect Damage spell effect. Upon successfully completing the quest, a trophy of an axe, a mace, or a sword (depending what was chosen for the Gatekeeper's right arm) will appear on a platform in Sheogorath's Palace. An achievement will be unlocked upon completing this quest. Attempting to speak to any of Relmyna's prisoners will yield the I have no greeting glitch. Occasionally, when the Cistern of Substantiation is created by Relmyna, it is possible for the player to sink into the ground surrounding the cistern. This typically occurs before the ritual has begun, so it is impossible to continue the quest. This can be fixed by fast travelling to the Gate. Felas Sarandas may fail to attack the new Gatekeeper and instead be found standing around in Passwall in Priest of Order robes, ignored by any of the Saints or Seducers in the area. Attacking him when he is in this state will count as a crime against the player. 10 Sheogorath has tasked me with rebuilding the Gatekeeper. He has given me instructions to visit the powerful sorceress named Relmyna Verenim in Xaselm to petition her assistance. 20 Relmyna has asked me to enter the depths of the Gardens of Flesh and Bone, and retrieve some mystical components needed for the ceremony to create the new Gatekeeper. I am to return with Blood Liqueur, Osseous Marrow, Dermis Membrane, and the Essence of Breath. She has given me a key that I can use to get into the Gardens and directly to her Sanctum when I return. 30 I have collected a vial of Blood Liqueur. 40 I have retrieved Osseous Marrow. 45 I have retrieved Dermis Membrane. 55 I have captured the Essence of Breath. 60 I now have all of the items required by Relmyna Verenim. I should return to her. 70 Relmyna has instructed me to choose the body parts with which we will create the new Gatekeeper. I am to pick out a head, a torso, a heart, a right arm, a left arm, and legs. I should speak with her when I am finished. 75 I have finished selecting the body parts for the Gatekeeper. I should return to Relmyna Verenim now. 80 I am to meet Relmyna Verenim at the statue of Lord Sheogorath in the Fringe where we will perform the ceremony to build the Gatekeeper. 90 Relmyna will perform the ceremonial magic, and I am to follow her instructions during the ceremony. 170 The Gatekeeper has been rebuilt. I should return to Sheogorath with news of my success. 200 Finishes quest Sheogorath is pleased with my progress. It is possible to use the console to advance through the quest by entering setstage SE09 stage, where stage is the number of the stage you wish to complete. It is not possible to un-complete (i.e. go back) quest stages. See SetStage for more information. This page was last modified on 26 August 2014, at 18:47.